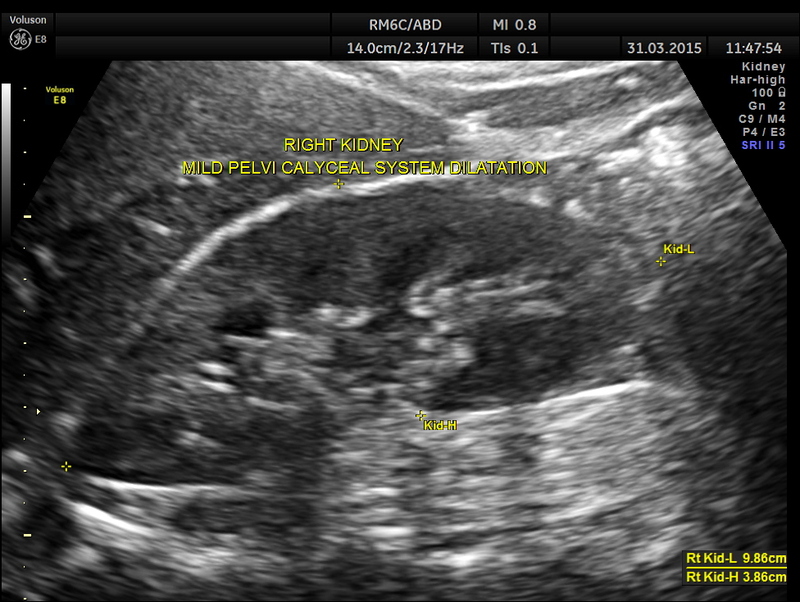 IS IT A URETERIC CALCULUS OR ……? This was a 34 year old man , who presented with features of right iliac fossa pain of 3 months duration , with increasing pain over the last 1 week.He gives history of some difficulty in passing urine. On clinical examination , he had diffuse RIF tenderness , with rebound tenderness. 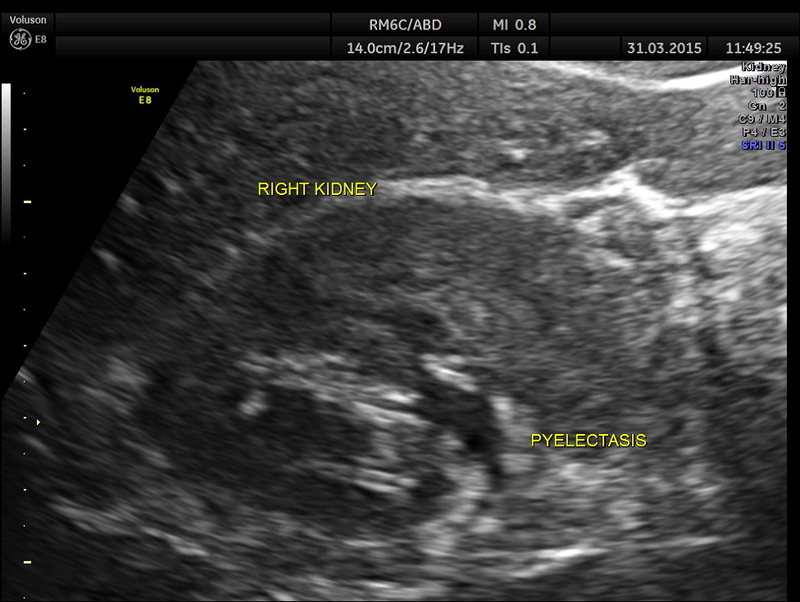 Right kidney shows mild pelvi calyceal dilatation. 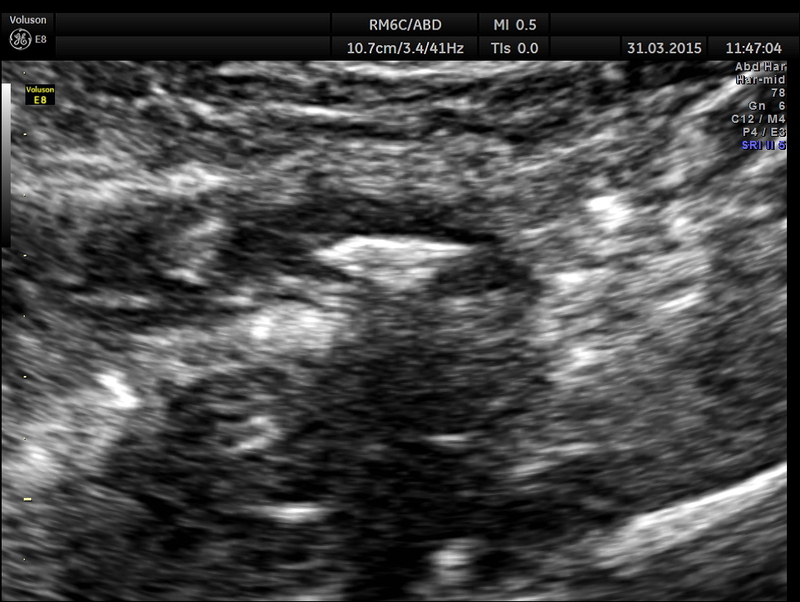 Scan ( with a regular abdominal probe ) over RIF shows an echogenic object with posterior acoustic shadowing within a dilated ” tube ” . Can we jump to the diagnosis of ureteric calculus now ? Is there an incongruity between the size of the calculus and the ” ureteric dilatation ” and the pelvi calyceal dilatation ? 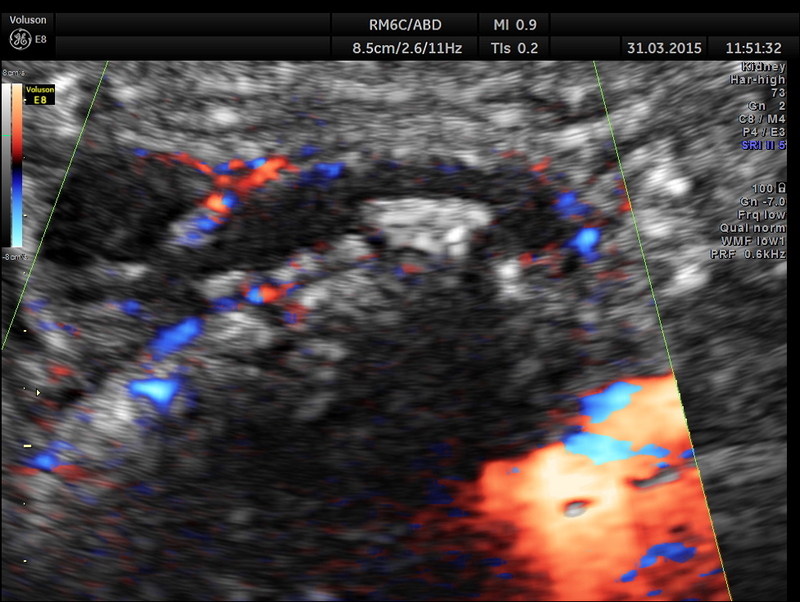 Colour Doppler shows vascularity of the wall . It was non pulsatile and non collapsible. 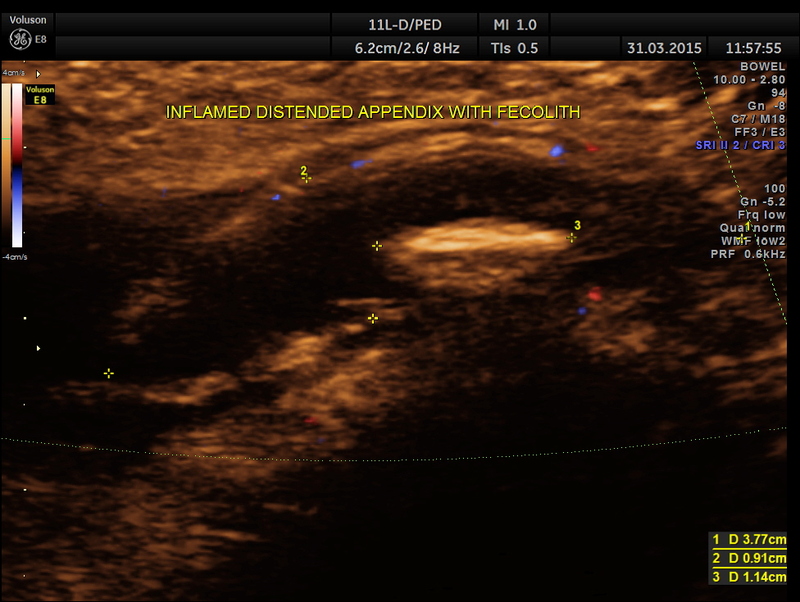 Now this looks more like an inflamed appendix with a prominent fecolith of size 11.4 mms , throwing a shadow. The following pictures are with a high resolution probe. The following picture shows the long and short axis views. Careful attempt to establish any continuity of the dilated ” tube ” to the ureter or dilated pelvis , showed that the dilated structure was separate from the right ureter . 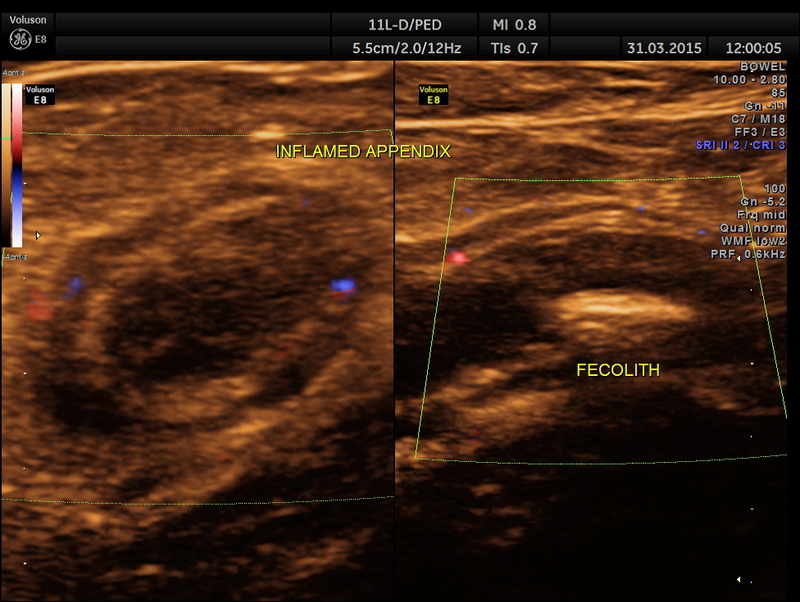 A diagnosis of Acute appendicitis with fecolith was made . CT scan of the abdomen confirmed the diagnosis and after surgery the patient is doing well. This patient had some misleading signs and symptoms . It is always better to establish the ” connection” between the dilated ureter and the kidney. 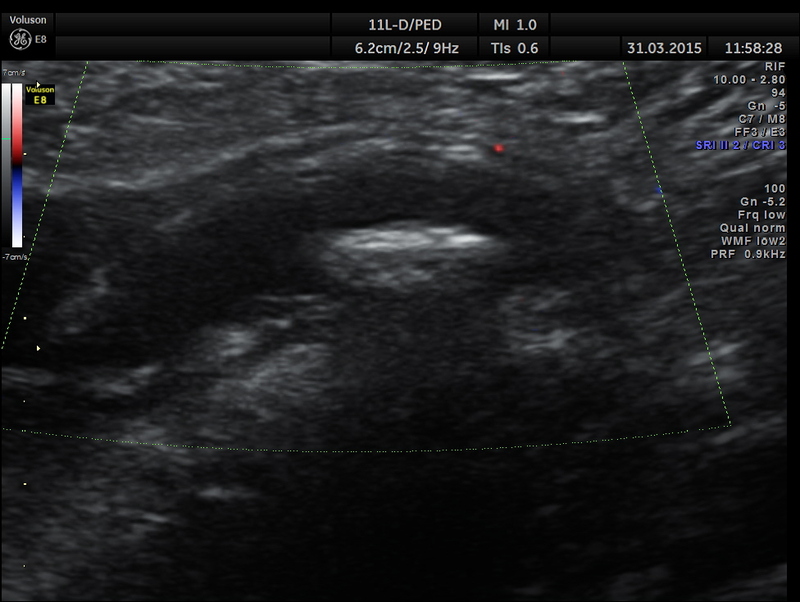 Usually appendix is picked up better with high resolution transducers. 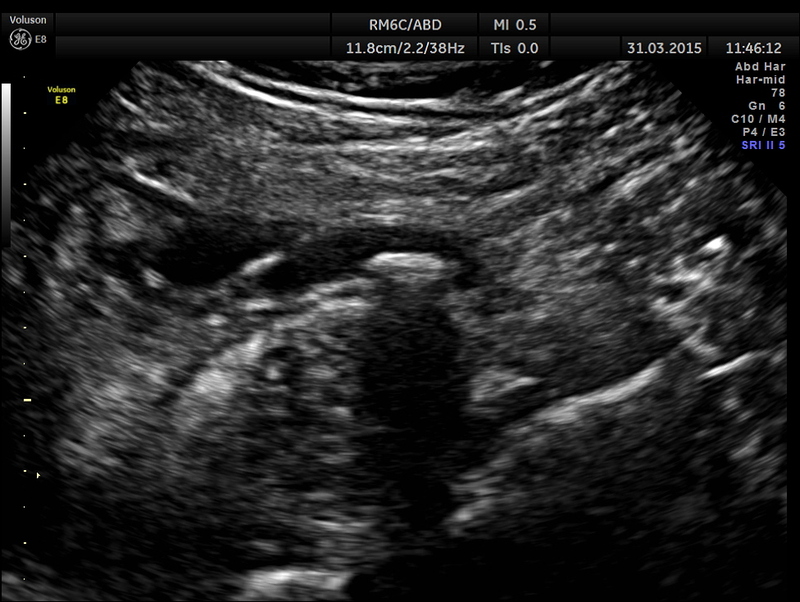 But in this patient , it was well picked up with a routine abdominal transducer. 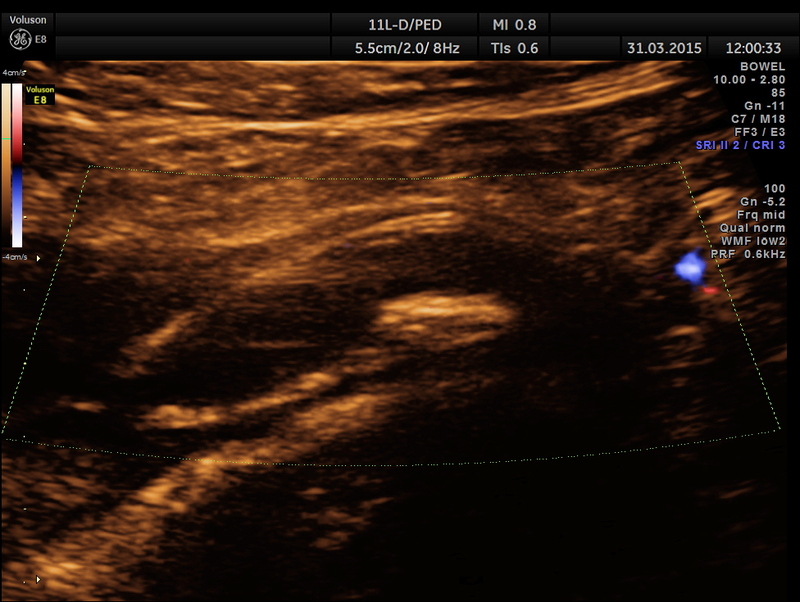 The colour doppler was useful in this patient also. Another good case Krishnan. Thanks. meticulous USG & Doppler are very useful. We presented cost-effectiveness of abdominal ultrasonography in appendicitis at the 45th AIUM annual convention on March 13,2001(JUM20:567,2001) from NMC,Rangpur,Bangladesh.